Tuesday is a day for easy trails and so I took my Hiking Chicks to the Black Links Trail. It was a rainy day and we wanted to do a short hike, so this was perfect. How do you get there: you take the number 15 bus that goes to the Peak just outside Admiralty MTR exit C1 Queensway Plaza to the right. Alight at Wan Chai Gap Road stop which is opposite the start of the trail. And we started our walk 16 ladies. Came across cats. Here’s cat number 1. And lovely views though it was a rainy day. There is a lovely sitting area for a picnic too. We continued straight on the trail and followed the Wong Nai Chung Gap sign. There are distance posts here too. Caught sight of some different flowers. And here’s cat number 2 and 3 posing especially for me. Lovely rock structures adorned the path. We continued straight,clicked a few pictures. We walked down the slope towards the end of the trail and spotted lovely flowers, lovely houses and also a vintage Rolls Royce. Finally we reached the bus stop where there are loads of buses that can take you to Central and also number 63 takes you to the North Point Ferry terminal which is close to the North Point MTR. This was a very short trail unlike the usual ones. But we finished just in time before the rain gods decided to send their blessings in abundance on Hong Kong. Do try this trail especially those with babes in Prams. Do be careful with your dogs as there have been cases of dog poisoning on this path. But otherwise it’s a lovely walk. The husband suddenly decided that he needed some exercise so he pulled my two sons aged 8 years and 8 months in tow with his wife and we hiked up Tai Tam on a hot Sunday morning. How to get there: Take the number 14 bus from Sai Wan Ho MTR exit A bus stop and alight at Tai Tam country park , Tai Tam Road. Do not forget to tap out as you get an HKD 2.8 rebate. Cross the road and the trail starts. Toilets at the start and water and juice dispensers too. What a crowd ! We kept walking straight. There’s a dog latrine too for those who hike with their Canine children. We kept walking. Saw a barbecue pit. That’s the first pit. We came across another sitting area. We came across another barbecue area where we’ve hosted loads of barbecues during winter. Do try it. We kept walking taking in the lovely views and we took the path stating Wong Nai Chung Gap. That’s where your climb begins and also that’s where we really started to sweat. Found some more sitting areas and picnic spots. Here to get to see lovely fish in the lovely greenish blue water. We followed the path and took the right. Such lovely greenery…they resembled Broccoli. And now we climbed again. Follow the distance posts… you’ll never get lost. And up we climbed amongst the flora and fauna. Saw beautiful butterflies on the way. And the end of the climb was in sight. Caught sight of these lovely flowers. So after taking a breather, we walked down Mount Parker and back home. A lovely Sunday hike if you feel like being in nature. Do try it people. Also this was not the clearest of days. On the clearest days you’ll get views like below. Yes you’ll get absolutely stunning sights on a bright, sunny clear day. 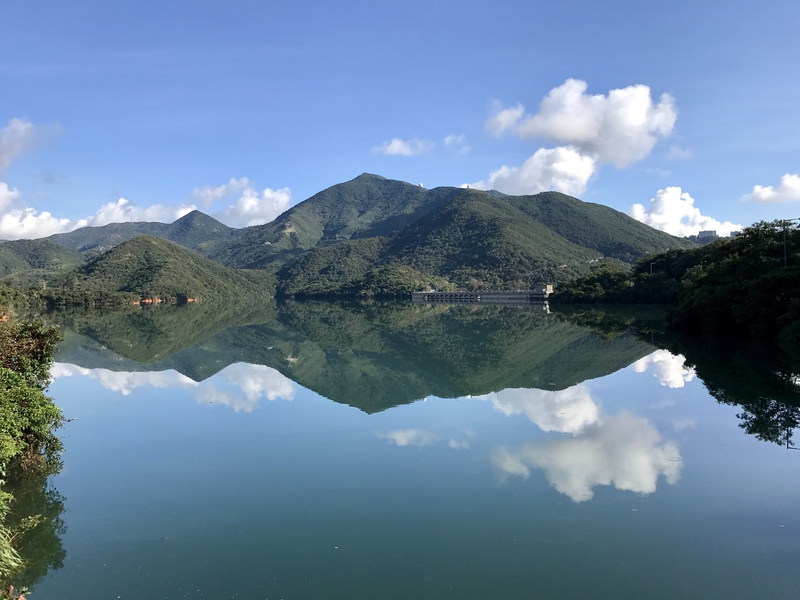 Tai Tam Reservoir Country Park is a must do. You can do it with family, with your kids, with baby in tow, dog etc. You will love it.